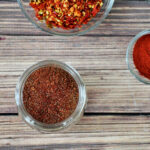 Why buy a mix packet when you can make your own Homemade Taco Seasoning? It is tasty, frugal, and you can make better flavors! Mix all ingredients and store in an air tight container. Makes enough for 4 pounds of ground beef.